We might be a few months into the New Year, but a new season (it’s officially Spring!) is the perfect time to incorporate new trends into your home. And our designers are always on the pulse on what’s up and coming in interior design. Trends have a way of moving in a circular motion. What once was popular will inevitably come around again. And what’s popular now may at some point be considered passé. As your furniture friend and confidant, we want to give you inspiration for what’s up and coming in the home décor world. Some of these may catch your eye and inspire you to go out and buy some new pieces—and some may not! Either way, learning about trends is a helpful step in building your design aesthetic. The first trend is one that’s been on the rise for several years now. And we can understand why! Incorporating soft, cozy textures into your home is not only aesthetically pleasing—it creates a comfy and warm atmosphere in the home. And although we’re moving towards warmer weather, there’s no reason you can’t still incorporate sheepskins, faux furs, and fuzzy fabrics into your home. A simple addition like a furry ottoman or a cozy throw adds visual density and welcome texture to what may be a one-dimensional space. Colors are always trending in and out of fashion. And right now blue is in, in all shades and all forms. Blue is a beautiful addition to any home for the calming and soothing effect it has. From teal to navy, shades of blue impart a watery and airy environment. They’re especially beautiful in rooms that get a lot of sunlight, as they cool down the warmth of the sun. There are endless ways to incorporate blue into your home—from wall color to adding a pale blue throw on white bedding. As the weather becomes warmer, blue is the perfect antidote to the heat outside and our designers have been loving it. With minimalism becoming more and more popular, a lot of homes are getting airier, brighter, and lighter. And that includes wood tones. Although walnut is still very popular, our designers are seeing the trend moving towards lighter woods like maple and ash. Performance fabrics were once seen as clinical and functional—incredibly cleanable and durable but maybe not the most stylistically attractive. That’s not the case anymore! 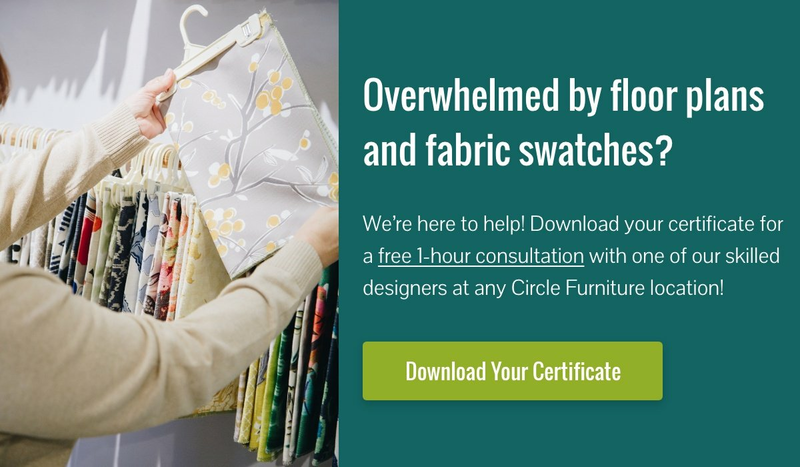 Performance fabrics like Crypton, Sunbrella, and Ultrasuede come in an endless array of colors and textures. Because of this, they’ve become increasingly popular. And like James Keeter, from our Boston showroom, explains, “It has a lot to do with lifestyle.” People want a fuss-free lifestyle, they don’t want to worry about eating on their sofas or chairs or the occasional spill that may happen with children. Performance fabrics give you some leeway, they allow you to worry less while not making any sacrifices when it comes to style. Where copper and gold once flooded the market, we’re now seeing brushed brass tones coming back. James sees this trend especially prevalent in bigger scale accessories like light fixtures and poles. When it comes to incorporating this tone into your décor, he loves to pair brushed brass with what he describes as “sunset colors,” like shades of blue, pinks and oranges. Plants have for a while, and will continue to be, a popular addition to the home. Looking past the health benefits, of which there are many, plants add beautiful color and a natural feel to interiors. And if you don’t have a green thumb? Faux houseplants are incredibly realistic and are a simple way to add color and texture to a space. This trend is, of course, going to be unique to you. Creating a sanctuary in your bedroom is a very personal endeavor. For some, it may mean adding in candles, a salt lamp, and a diffuser to create a spa-like environment. And for others, it could mean adding plush, lavish textures and gold tones for a royal feel. Learning about trends and finding inspiration is a wonderful way to discover what you love and what you may want to incorporate in your home. And inspiration can be found everywhere, check out shows on HGTV, home décor magazines, Pinterest, and Instagram to see what piques your interest. We want to emphasize that finding current inspiration and staying on top of trends is a great way to add life to your home—but there are no rules. Trends come and go, and the important thing is that your home décor speaks to you and has meaning. Follow your intuition and don’t get swayed by what’s popular if you don’t truly love it. We think taking a stroll around our showrooms and chatting to our knowledgeable designers is the perfect way to gain insight and inspiration for your next design project—no matter how big or small. Haven’t met our designers yet? Meet them here!